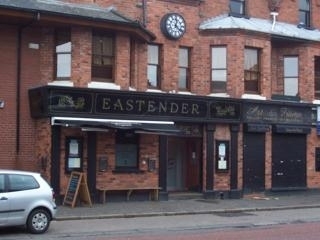 The Eastender in east Belfast. 02/11/2011 : According to https://www.facebook.com/pages/Eastender-Bar/215663515129304 now closed. Have you got Google Earth on your computer? If so, then download the Google Earth view of The Eastender. Is this the wrong position for The Eastender? If you think so, then modify its position. Click / Tap the button above to get directions from where you are to The Eastender. Will never be back in here again. Used to be my local when I lived nearby and it was great then. Was in it the other night and there was live "music" which was a joke. Glorified karaoke was more like it. The woman kept passing the mike over to people who were too drunk to sing. Music was so far too loud for the size of the venue, there was feedback, distortion and clipping from the speakers, couldnt make out anything. (Ive played in a professional band for several years so know what im talking about). Bar staff are all new to me and were not friendly at all. I ordered a guinness and was told they would bring it down to me, they didnt, I went back and collected it from the bar and they just stood leaning against the wall and watched me, no apology etc. Later in the night when I went up to mention the sound level of the music, and how the equipment wasnt able to handle the levels the barstaff laughed, said its always that loud then girl actually walked away from me. After a few hours in there on a Friday night my ears will take at least the weekend to recover. Go there all the time and you WILL damage your hearing, barstaff are probably already f*cked but dont seem to care. NEVER again. Used to be a great bar. So disappointed. Best pub in the east, you will have no bother there. Its the best bar in the east, staff are friendly entertainment is good food is nice and there always seems to be a friendly atmosphere, the football team provide an atmosphere on a saturday for the match without them there wouldnt be much of an atmosphere. The price of a pint is reasonable if you consider the price of others you get what you pay for, drink promos on a saturday and on a sunday, live sporting events 3 Tvs my advice would be to go try it yourself i enjoy it. Great place and great atmosphere . Loving the updated menu and the meal deal. It' not everywehre you get a bottle of vino for £ 6. Entertainment super and the Sunday night is a great idea. As for the place being overrun by footballers that is nonsense!!!! Keep it up guys, especially the drinks promotions. The only real bar on the Cregagh road....not great for smokers as it,s upstairs, but does a very good value lunch. The free entertainment on a Friday and Sat evening makes it a lively spot at weekends. Recommended. Not a bad wee place to grab a lunchtime pint during the week.